Fan Forum > Info Center > Fan Forum's 20th Anniversary Celebration! Fan Forum's 20th Anniversary Celebration! Twenty years! What an amazing milestone! to discuss the TV show Dawson's Creek. to discuss their Fandoms with others who shared their passions. general interests such as Movies, Music & Off Topic. so a separate board was created for Spoilers. creating a comprehensive forum for fans. We would like to make special mention of the Young Americans fandom. and the board is still going strong today. I can't believe it's been 20 years already! with that, but it branched out from there quickly. making Fan Forum such a unique and awesome place! I’m so incredibly proud and thrilled that Fan Forum has reached such a major milestone in its history as we celebrate our 20th Anniversary. From a website that started out with one forum and a couple hundred members, we’ve grown into a website with over 200,000 registered members and so many loyal Members, Moderators, Team Members and Managers who’ve helped make Fan Forum the best website of its kind on the Internet. There are so many people who’ve contributed so much to this website, from the Moderators and Moderator Managers who help make sure all the forums here run smoothly to the Graphics Team Members and Managers who contribute their considerable talent to giving each forum here its unique look, to the Communications Team Managers and Members who “get the word out there” on various Social Media Sites about our website, and to the Moderator Support Team Managers and Members who make sure that all of our forums are covered when people are away or when we add new forums. I’m very happy to have played a small part in watching this website grow and prosper during all of the changes and challenges that we’ve faced over the years, and I look forward to continuing to lead this website as we move into the future. Goldenboy, who started this website and who continues to provide us the support to keep us here. Raonaild, who does an invaluable job in keeping us up and running and managing our servers. Johnnie, who manages the Requests System along with L i N d $ @ y that allows us to add new forums that you, our members, vote in. Chris, who manages the Moderator Manager Team and who works tirelessly for this website. NikNak and ♥ Gale's Fragile Beauty, who, along with Johnnie manage the Moderator Support Team and who appoint and remove Moderator Support Team Members on a daily basis to ensure that all of our forums here have people to look after them when the regular moderators are away or when new forums are added. shinebrighterxx, spacekru, and vale decem, who manage the Graphics Team and who do so much to make this website such a beautiful place. chaos blues, who manages the Avatars System that allows people to select avatars from each forum here. dancing in the rain and looking at the stars, who manage the Communications Team and who’ve helped us be a part of Social Media and who make Fan Forum known to more people. Most of all, I’d like to thank all of the Members of this website, because without you, we wouldn’t be here. There have been a lot of changes over the last 20 years, and a lot of websites have come and gone, but we’re still here because of you, so I thank you from the bottom of my heart. ~ Boards organized by forum number. Fan Forum is the place it is today because of our members. For our 20th anniversary, we'd like to acknowledge our long term posters. ~ Members since 2000 with at least 10,000 posts, and have posted this year. Post counts as of November 20th. Thanks so much to the people who shared a memory. 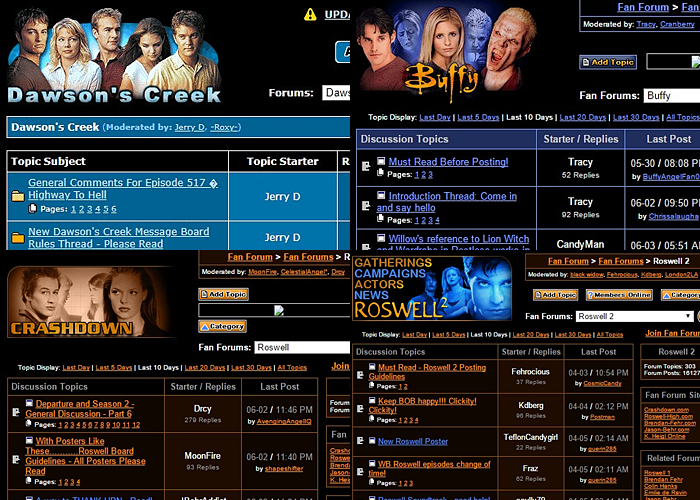 I started posting on Fan Forum in August 2000 because I was a fan of the show Roswell. Even after the show was canceled, Fan Forum was a place I grew attached to, so posting was something I wanted to continue. I've met lots of wonderful people because of this site, some of whom I was lucky enough to meet in real life and I continue to spend time with them in real life. I love Fan Forum because of its friendly and welcoming atmosphere and because of it's wide range of topics. It is a great place to go and discuss topics of interest with friends. Where has the time gone? 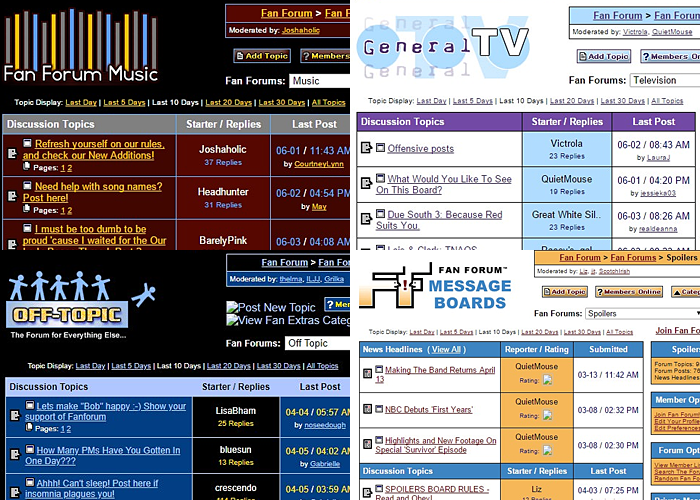 I remember randomly typing names into the address bar and coming across Fanforum years ago. I joined mainly due to my interest at Charmed at the time. Had a nice discussion with Brendan Fehr once on his board, still waiting for some money that he offered me for something. My first board I looked after was Requests with Leif back in March of 2001. Had a blast campaigning for a long time for a Star Trek board until we were finally able to get it. It's been a blast working with a few different people there over the years and seeing new faces come together to get boards added. I used to work with with the Website Teams back when that was a thing for darkangelfan, doing quizzes for the show of different difficulties. I think this eventually led to the various crosswords I've done for boards over the years where it involves looking at things a lot closer than normal. This has been my home for many years, even with all the new social media over the years, it's not the same to me posting about topics on here. I still come to FanForum for that. Many people have come and gone over the years, luckily there's still a good amount of people I've met over the years on the site as well as some newer ones I've met over the years. I hope we're still around in another 20 years. Happy 20 years ! I first posted on on the Roswell board when it was in its first season. Through the years I have made so many great friendships through . I have even been fortunate enough to meet some friends I made through Fan Forum in real life, and even went to a Fan Forum wedding! The couple met through Fan Forum! Fan Forum is a great place to come together to discuss your favorite fandoms and topics. The range of boards and the community is diverse and inclusive. There were so many great memories made here and I look forward to many more decades of making new memories and new friends. Fanforum hasn't just seen me grow up through the years, but it has helped me grow up as well. It's been a place where I've been able to make friends, find my voice and, ultimately, become the person I want to be. You hear a lot of things these days about how judgmental social media is; how it creates a gold standard none of us can ever hope to reach. Well, Fanforum has always been and remains the complete opposite of that. It's full of wonderful and flawed people who support each other as they are. And that's pretty amazing. - It’s such a wonderful milestone and an incredible accomplishment that Fan Forum has reached it’s 20th Anniversary! I first discovered Fan Forum when someone linked to it from a long since departed Katie Holmes Website, and the person who posted the link made a disparaging comment about how they liked to talk about Dawson’s Creek in depth here instead of talking about how “hot” Katie Holmes was like they did at that website, and I thought “that sounds like the place for me” and boy, was I right! Over the years I saw Fan Forum grow from a small website with one forum and a few hundred members to the website that it is now, and I’ve enjoyed every minute of it. I have so many incredible memories tied to this place and I’ve made some amazing friendships here, and although the Internet has changed tremendously over the last 20 years and there are a lot more places for people to spend their time, Fan Forum remains the place on the Internet for me, and I love it more than words can say. My thanks to Goldenboy for starting this website and continuing to support it and my thanks to everyone who’s a part of this website, past and present. Happy 20th Anniversary everyone! The reason I first came to FF was because I was obsessed with a TV show and couldn't find anyone to talk about it with in real life. So I stumbled upon this place and it was so nice to find people who shared my love for this show. Being able to talk about plots or over analyze spoilers or fangirl or even rant about something was awesome! This place is like a little community and it's amazing that you can "meet" people from all around the world who share your love of a tv show, a movie, a celebrity or something else. My Charmed fandom started during its first season. I believe that I started watching from the episode Feats of Clay. Before that, I was already aware of Shannen Doherty, from her work in Beverly Hills, 90210, and Alyssa Milano, from her work in Who's The Boss and Melrose Place. Shannen had developed a reputation of being difficult to work with since she left BH90210 at around its fourth season. When the show was going to be produced by Aaron Spelling, who was known for nighttime soap operas, I further hesitated to watch. I had not known about Holly Marie Combs, other than I was barely aware she worked in the CBS TV show Picket Fences. By that time, I was already an avid viewer of The WB. It was a network that was willing to take risks with shows that would not last long in the mainstream networks. So I eventually decided to give Charmed a chance. Immediately, I felt good watching a show that was fun and didn't take itself too seriously. The actresses did a great job showing the emotions of sisters who have to deal with a supernatural legacy. It has moments of wackiness, flightiness, off-key humor and, yes, very tender moments. Constance Burge, who helmed the series in its early years, gave the show its heart. So around that time I was frequenting a popular culture and message board site called Greenroom Online. Alyssa Milano was very involved in that site. There, I met a few people, one of whom was named Selkie. As I started interacting with the people there I had learned about Forum 4 Fans, which already had set up a board dedicated to Charmed. I wasn't long before I signed up. This was in the year 2000. In the next two years I was the person who would share (non-spoiler) news about the show, the actresses, including pictures from public events that they attended. The mods were impressed with what I was doing that I became one of their favorite posters. Also around that time there was a major change in the casting. Shannen was out and Rose McGowan was in and there was a lot of debate over whether the show could continue. Long-time posters like Rahul and stefan began souring on the show. So they left eventually. I held on, since the show still had elements that I found appealing (and was still hoping in the back of my mind that Shannen would return at some point). Charmed had become a habit to me that I just didn't want to let go. The Fan Forum Charmed board had become a safe spot for me to escape the daily doldrums of life. Little did I know that I would be picked to become a board moderator. Having the responsibility to monitor the action and keeping the discussion clean is a big challenge and when I started it was so weird having some power to help keep the flow going. Having access to the moderators board, I felt a certain privilege having a look behind the scenes of the running of this site, even when I knew I didn't have the privileges of the administrators. I was a moderator for a while when at Greenroom Online but it was just a chat board and we we're all just winging it just for fun. At Fan Forum it's a much more serious affair, even though there were fun moments like celebrations and the such. My first co-moderator was M & M. She eventually left because she has lost interest in the show. M & M was replaced by Lovely Lauren (Suz), who is now a Moderator Support Team member. That lasted a couple of years before she moved on. My next co-mod was Jacqueline, who goes by the name of J Erlotiel L. She's very cool and shares so much of my enthusiasm for the show. We met one last August day when she was visiting New York from Sweden. It was great for co-moderators to meet in person, so a day I'll never forget. Unfortunately, it was almost a week before Hurricane Irene made a visit. She already had returned home before the hurricane. During her time as co-moderator we had to work hard to get the board traffic moving. It was placed on probation a couple of times but we managed to bring it back out of them. If someone told me I would still be a moderator today I would not believe him. There was one problem member who was a big fan of Julian McMahon, who played Cole on the show. I remember her being cantankerous and headstrong, who insisted that the show needed to focus more on Julian's character. However, it didn't end there. She took it personally whenever someone disagreed with her. Soon enough, she took to harassing other Fan Forum members and she was banned. But of all the troublemakers on our board, which were thankfully very few, she's the one that stands out the most. Eventually, Jacqueline's life made it difficult to keep up with the board and she eventually stepped down. So now I'm with Jaje, currently going by the name of never broken. I have had a good time moderating the board. It's been the only board that I ever modded and it'll probably remain that way once I decide that I'm done, which who knows when that'd happen. Chris, I appreciate Fan Forum for asking for my input. Hopefully, my story would help inspire future moderators to keep going when things are down. Current Top 20 Posters ~ Post counts as of November 20th. who have served on our various teams. - actively seeks affiliation with other sites and maintains a presence on social media. - creates the lovely banners tailored to each board. - oversee new boards, and supervise established boards when the regular mods are away. - keep the various boards organized and help create a friendly posting environment. For this celebration we'd like to recognize people who have been continuously moderating the same board for 10 years or more . Thank you to everybody who has served on any team here. Would you to enter a contest to win a name change or custom title for the rest of the year? Just post on this thread telling us something you like about Fan Forum, or share a memory. Then copy & paste your post in a PM to Chris titled either name change or special title. Thanks for posting this Jerry. I got a bit of a whiplash again seeing the old so now I'm currently listening to Paula Cole's "I Don't Want To Wait" while posting here because ah, bless those good old days and all the shipper wars. Happy 20 years ! I'm so proud of this forum and all the amazing people I have met here some of which are my online friends and some of which are already my friends in real life. I have been here on this site longer than I have been in any of my jobs which is saying a lot. FF has been a place where I can have fun and relieve any stress in real life and while these past 20 years have not been all smooth sailing, it's the people here that has made me come back again and again (and has made me stay). In particular Harry Potter is a board that I am so proud of and I have been on the longest. It's a board that holds a special place in my heart and in spite of all the stress that comes to moderating that board many years ago, it's still the fandom that I love the most. Cheers to more milestones and achievements ahead! Thank you to all the posters, mods, managers & admin team for making this such a wonderful place to be a part of. this!! TY for posting it Jerry! I joined in 2012, I was watching The Vampire Diaries at the time. I was looking for an Ian Somerhalder message board, so I googled and that's how I found ! Love being a part of Fan Forum, have met a lot of great people on here! And how appropriate that this is around Thanksgiving (in the U.S.). Thankful for ! Happy 20th to the forum! wow, the OP is awesome! congrats on 20 years! thanks everyone who was here originally and to all who have come here since, love this place! keep up the great work! Yay Happy 20th Anniversary to I love the op too! Thanks for the celebration, it was great to read through all that. I wish I'd found sooner when I was heavily into the fandom of Lotr in the early part of the century. Still I found it in the end through a love of Once Upon a Time. It's great to be a moderator here. This is awesome Congrats to FF and everyone involved! 20 years is such an incredible milestone! I found in 2000 when looking for information about the show Young Americans. At that point I just lurked, but was totally amazed to find out that other people enjoyed the show as much as I did. In January of 2001 I took the leap of faith and joined to share my own opinions, and haven't looked back. Although if you had told me then that I'd still be active here 18 years later, I wouldn't have believed it. Soon after joining, I got involved in the Star Trek campaign. That board has been my online home ever since the board was opened in December 2001. I've made some wonderful friends here over the years. There's nothing like to make time zones and world events real. I remember hearing about 9-11 and being anxious to check in here to find out if online friends were okay. Thankfully they were, but one person lost a brother. - Leif for creating and continuing to keep the site online. This has been a wonderful place to connect with people who love the same topics we do, and I'm glad to have been apart of it for the last 13 years. Thanks to the Gilmore Girls board for drawing me here, and everyone else for keeping me here! Wow... 20 years... that's amazing. Thank you for all the work all the fan forum staff has done through the years and thank you for all the work you have done this past year. I joined in December 2011 and met a lot of nice people around the board. My most memorable experience was the Posting challenge in January 2014 with the Kat Grahm board. That posting group was amazing. That year was amazing too as I helped a few other posting challenges and met lots of great people.